Warning: This post will lack all objectivity whatsoever and might bore you if you're not a Novak fan. I am absolutely not sorry. Come meet #UNIQLO brand ambassador Novak Djokovic (@djokernole) @ our #NYC 5th Ave Flagship on Weds 8/22! I haven't seen this tweet, as I wasn't even following Uniqlo's twitter, but it was kindly brought to my attention by the wonderful Cat (aka @catlovestennis). I had 2 reactions to offer. I panicked for about 5 seconds, and then my brother and I rushed out towards the subway station. What was usually a 15-minute walk was probably done in half of that time. When we got out, we practically ran towards the store. Luckily for us, the lovely Katrina (aka @returnwinner) got there much earlier than us and had a great spot in the queue. We joined her, and had a great time waiting for the opening together, while wondering how come the Rolex and Lindt (read: Federer's sponsors) stores were right across the street from us, Swiss flag included. While waiting, we had to sign forms with our consent to sell our soul to the devil let Uniqlo use all pictures and videos from the event as they wish. We also received lottery slips, with the chance to win tickets to see Novak in the US Open if we'd won. At about 10:02am (I was looking at my watch a lot. It has since stopped working), the doors of the Uniqlo store were opened, and the line started moving forward. At some point, mass excitement ensued outside, as Novak could be seen coming down the escalator inside the store. The impatience among those of us still outside was quickly rising. Ten minutes later or so, I was already by that escalator myself, receiving last instructions: no autographs, no cameras/phones of your own, as there's not enough time. Each fan gets a photo with Novak, taken by Uniqlo's photographer, with photos due to be published on their Facebook page later that day. In my hand, I was clutching a short letter I've wrote the night before, with various greetings and good luck wishes to Novak from me and his fans. And so, the following scene unfolded. Novak: Yes, of course, thank you! Novak: I love your shirt! The photographer wasn't too good. But Novak's holding my letter. I guess it really happened? It was all over in about 20 seconds. We were sent one floor upstairs, to take a look at Uniqlo's new collection for Novak, but we were more interested in watching him interact with the other fans and trying to get pictures. He was utterly adorable with the little kids, when a girl asked for a hug he obliged, and he said something to every single fan who took a photo with him (there were about 170 of those). Jelena Ristic, Novak's girlfriend, was there too. Check out my Facebook page for some photos of all that. We didn't win anything in the raffle, but by that point I didn't care about that too much. 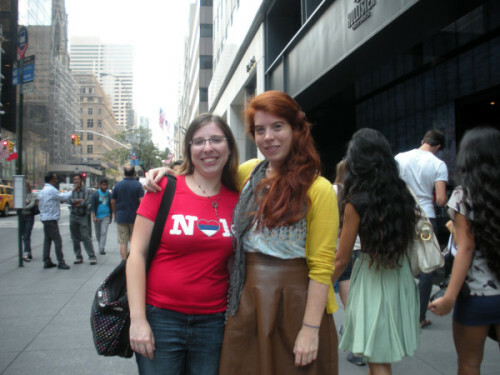 We said goodbye to Katrina (who's still in NYC, being the superfan that she is), and went on our way, enjoying our last day in New York.